The varicella-zoster virus (VZV) is a virus of the subfamily of Alfa virus responsible for infections with different clinical presentations. Primary infection occurs more frequently in the paediatric age presented as chickenpox. The reactivation of the infection occurs mainly in immunosuppressed patients, in the form of Herpes-Zoster. Varicella-Zoster virus is associated with severe neurological complications, including post herpetic neuralgia, aseptic meningitis, polyneuropathy, cranial nerve palsy, meningoencephalitis, vasculopathy, encephalitis and transverse myelitis. 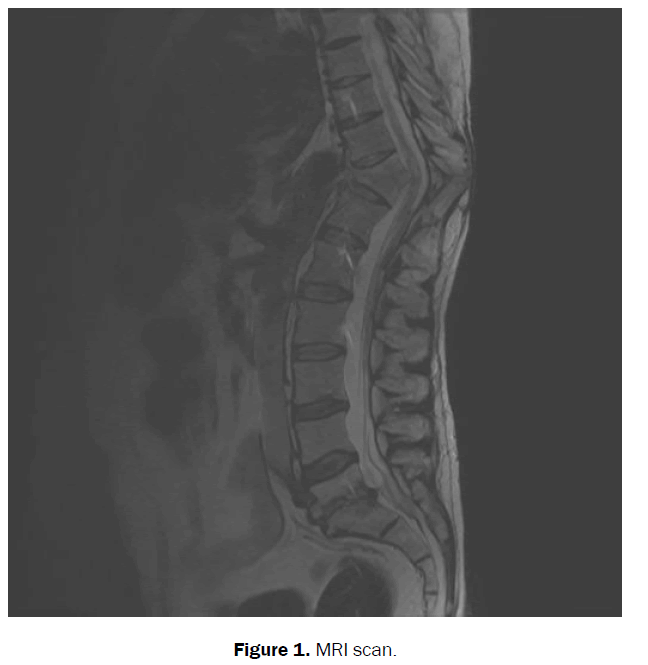 A review of Transverse Myelitis due to VZV is presented, regarding a case of Acute Myelitis by VZV with poor response to treatment in a HIV patient. Literature is reviewed with special focus on diagnostic and therapeutic strategies. The varicella-zoster virus (VZV) is a virus of the subfamily of Alfavirus responsible for infections with different clinical presentations. Primary infection occurs more frequently in the pediatric age presented as chickenpox. The reactivation of the infection occurs mainly in immunosuppressed patients, in the form of Herpes-Zoster . Varicella-Zoster virus is associated with severe neurological complications, including postherpetic neuralgia, aseptic meningitis, polyneuropathy, cranial nerve palsy, meningoencephalitis, vasculopathy, encephalitis and transverse myelitis [2,3]. A 42 year old male, there is no history of allergies, former opiate addicts, with a history of HIV-1 infection with poor adherence to treatment, chronic HCV genotype 1a with CT-type IL-28b polymorphism, sensory-motor polyneuropathy, spondylodiscitis D10-11, L5-S1 (June 2012) and severe cryptococcal meningitis (June 2016), He was in treatment with Abacavir/Lamivudine 600/300 mg, Dolutegravir 50 mg, Flucozanol 200 mg, Levetirazetam 1000 mg, Cotrimoxazole 800/160 mg, Tramadol 200 mg, Lormetazepam 2 mg, Dipotassium Chlorazepate 10 mg and Metamizole. On examination: Blood pressure was 150/112 mm Hg; heart rate 97 beats per min; temperature 36.5°C. Cardiopulmonary, abdominal and neurological examination showed no alterations. No stiff neck was appreciated. A blood test was performed with glucose, urea, creatinine, ions, haemogram, transaminases, and coagulation study in the normal range. Cerebral CT was normal. Due to the recent episode of meningitis and needing intravenous analgesia, he was admitted to hospital. We performed complete analysis with immunity profile which showed CD4 lymphocytes 46/mm3, CD4/ CD8 ratio 0.11, HIV viral load 43 cp/mL 48 h after admission, the patient began with marked conscience level fluctuations and progressive paresis of the lower left limb with altered sensitivity. MRI was performed as shown in Figure 1 discarding medullar compression, but aiming for signs of acute myelitis, so lumbar puncture was performed. The lumbar puncture sample showed: red blood cells 30/mm3, leukocytes 390/mm3 (lymphocytes 74%), glucose 129 mg/dl, proteins 700 mg/dl, ADA 26 U/L. Viral load CSF 194 cp/ml. Microbiological results were: not germs; negative culture, bacilloscopy negative, and L-J culture negative; Cryptococcus negative .The complete serological study was negative for toxoplasma IgG, CMV IgM, parvovirus b19 IgM, Borrelia IgG. However it was positive EBV and VZV PCR. We started treatment with aciclovir 10 mg/kg tid for 21 days plus boluses of methyl-prednisolone the first 5 days. A new lumbar puncture was performed after treatment, which showed red blood cells 0/mm3, leukocytes 52/mm3, glucose 71 mg/dl protein 215 mg/dl. The result was Negative Microbiology. Neurotropic viruses PCR were negative too. The patient continued with left lower extremity monoparesis and sensitivity deficit with no response to treatment. During admission, the patient required antipsychotics due to frequent episodes of delirium making impossible to have a new control MRI, moving to a hospital for a medium-long stay for rehabilitation. The diagnosis was acute myelitis due to Varicella Zoster Virus with residual monoparesis. Transverse myelitis (TM) is the result of an inflammatory focal lesion of the spinal cord, with sudden onset. It is characterized by the appearance of inflammation, edema and necrosis in one or several spinal segments, causing an alteration of the motor, sensory or autonomic function. The immune pathogenesis of TM is varied and reflects the rather diverse spectrum of this disease from idiopathic mechanisms to myelitis associated with the disease. There is evidence of perivascular infiltration by monocytes and lymphocytes in the lesion . Histopathologic studies of spinal cord tissue obtained from biopsies and autopsies of TM patients have shown evidence of focal spinal cord inflammatory changes . A recent study, noted that pro inflammatory cytokine IL-6 was markedly elevated in the CSF of patients with acute TM as compared with CSF from control patients and patients with acute MS flares. Of importance, the CSF level of IL-6 in acute TM patients strongly correlated with and was highly predictive of disability. This pathological heterogenicity and involvement of both the gray matter and the white matter suggest that TM is not a pure demyelinating disorder but a mixed inflammatory disorder affecting neurons, axons and oligodendrocytes and myelin [5,6]. The pathogenesis of the neurological complications associated with VZV infection is unclear. Allergic and vascular mechanisms have been suggested for some of these neurological complications that occur after infection with primary varicella and herpes zoster . In idiopathic acute transverse myelitis, there is a perivascular intraparenchymal cellular flow in the spinal cord, which results in the rupture of the blood-brain barrier and a variable demyelination and a neuronal lesion . However, the pathogenesis of VZV myelitis has been thought of a direct viral invasion because the VZV particles were found in glial cells and the virus was isolated from the spinal cord of patients with zoster myelitis . It is postulated that the reactivation of varicella zoster virus (latent in the dorsal root ganglia of the spinal cord, in the Gasser ganglion of the trigeminal and in other cranial nerves) can therefore produce neurological complications, being the most frequent radiculopathies and cranial neuropathies. However, myelitis, encephalitis and vasculitis of the central nervous system can also be triggered  Axonal degeneration has also been reported . The clinic can develop acutely (hours, days) like this case or sub-acute (1-2 weeks) and present alone or associated with viral, bacterial, fungal infections, vaccines, vasculitis, drugs, autoimmune diseases, or trauma . There is motor, sensory and/ or autonomic dysfunction. Motor symptoms include a rapid progress paraparesis that may involve the upper limbs with initial flaccidity followed by spasticity. Typical sensory symptoms are pain, dysesthesia, and paresthesia. Autonomic symptoms include increased urinary urgency, urinary and intestinal incontinence, difficulty or inability to complete urinary evacuation, intestinal constipation and sexual dysfunction. Our patient developed the incapacitating clinic within 48 h of admission but associated headache in previous days. We do not know if it could be prodromes of the disease or an independent, isolated problem. It is estimated that approximately 25-40% of cases of myelitis are due to viral infections such as Herpes virus and Polio virus . MT is a rare neurological complication in Varicella-Zoster virus infection, described mainly in immune compromised patients, although cases have also been reported in immunocompetent patients [14,15]. Notably higher is the prevalence of encephalitis due to VZV, as reported in numerous studies [15,16]. Regarding the diagnosis, the initial evaluation should be accompanied by an imaging test (gadolinium resonance) (Figure 1) to exclude a compressive disease requiring urgent neurosurgical intervention . If no compressive cause is found, a lumbar puncture for CSF study should be performed to distinguish an inflammatory or non-inflammatory aetiology (ischemia, lipomatosis or fibrocartilaginous embolism). The absence of pleocytosis along with the non-enhancement of gadolinium in NMR may suggest vascular aetiology. At the same time, the clinical characteristics of the patient and a complete analytical study are indispensable for a correct diagnosis . Neurological complications due to VZV are more common in immunocompromised patients, especially in the HIV population with CD4+<100 [19,20]. The CSF analysis plays a key and fundamental role in the detection of VZV. Occasionally the diagnosis is clinical, due to the non-possibility of isolating VZV DNA or antibodies in serum or CSF, by PCR or ELISA respectively, as described in several reports . Sometimes, MV caused by VZV is diagnosed based on the detection of typical vesiculous lesions in metameric distribution with signs and symptoms suggestive of myelitis. However, cases of VT by VZV have been described in the absence of cutaneous lesions, as is the case described [19,22,23]. TM is a rare entity, as described by the study by Liana Falcone et al. a review of cases of VZV/myelitis/radiculitis in HIV/AIDS patients . Treatment for transverse myelitis should be individualized. Antibiotics, antivirals, high doses of corticosteroids and intravenous immunoglobulin have been used, but the evidence on the efficacy of most of them is not completely defined [18,25]. Treatment with Aciclovir 10 mg/kg tid is usually given for 10-14 days intravenously. Even without placebo-controlled trials that evaluate glucocorticoids specifically in MT , there is good evidence that intravenous glucocorticoids are effective in acute inflammatory diseases of the central nervous system like TM. Plasma exchange can be effective for acute demyelinating diseases of the central nervous system that do not respond to the high dose of treatment with glucocorticoids . HIV-infected patients have a higher risk of developing herpes zoster than the general population and therefore have an increased risk of neurological complications. TM is a rare clinical entity; its diagnosis is mainly clinical, based on clinical, imaging (MR) and lumbar puncture. There is no established treatment regimen. Many studies recommend high doses of corticosteroids and intravenous acyclovir in order to avoid progression and added complications such as post herpetic neuralgia and vasculopathy. This fact highlights the need for early anti-viral and anti-inflammatory treatment in order to try to eradicate viruses and prevent future neurological events. Steiner I, et al. The neuotropic herpes virus: Herpes simplex and varicella-zoster. Lancet. 2007;6:1015-1028. Gershon AA, et al. Advances in the understanding of the pathogenesis and epidemiology of herpes zoster. J Clin Virol. 2010;48:S2-27. Ong OL, et al. The importance of early diagnosis of herpes zoster myelitis. Med J Aust. 2010;193:546-547. Krishnan C, et al. Demyelinating disorders: Update on transverse myelitis. Curr Neurol Neurosci Rep. 2006;6:236. Katz JD and R opper AH. Progressive necrotic myelopathy: Clinical course in 9 patients. Arch Neurol. 2000;57:355–361. Irani DN and Kerr DA. 14-3-3 protein in the cerebrospinal fluid of patients with acute transverse myelitis. Lancet. 2000;355:901. Orme HT, et al. Spinal cord infarction identified by diffusion-weighted MRI (DWI). Neurology. 2007;69:398. Zijdewind JM et al. An aggressive case of PCR negative varicella zoster virus induced transverse myelitis. Neurol Sci. 2014;35:961-963. Frohman EM and Wingerchuk DM. Transverse myelitis. N Engl J Med. 2010;263:564-572. Arenaza-Basterrechea N, et al. Parainfectious longitudinally extensive transverse myelitis associated with varicella-zoster virus. Neurologia. 2016:30022-30026. Takahashi et al. Varicella zoster myelitis in two elderly patients. Case Rep Neurol. 2013;5:81-90. Mailes A and Stah JP. Infectious encephalitis in France 2007: A nacional prospective study. Clin Infect Dis. 2009;49:1838-1847. Granerod J, et al. Causes of encephalitis and differences in their clinical presentations in England: A multicentre, population-based prospective study. Lancet Infect Dis. 2010;10:835-844. Hauser SL and Ropper AH. Diseases of spinal cord. In Harrison’s Principes of Internal Medicine. Volume 2. 17th edition. Edited by Fauci AS, Braunwald E, Kasper DL, Hauser SL, Longo DL, Jameson JL, Loscalzo J. United States of America: McGraw-Hill; 2008:2588-2596. Kaplin AL, et al. Diagnosis and management of acute myelopathies. Neurologist. 2005;11:2-18. De la Blanchardiere A, Rozenberg F, Caumes E, et al. Neurological complication of varicella-zoster virus infection. Scand J Infect Dis. 2000;32:263-269. Vafai A, Berger M. Zoster in patients infected with VIH: A review. Am J Med Sci. 2001;321:372-380. Takahashi T, et al. Varicella Zoster Vrius Myelitis in Teo Elderly Patiens: Diagnostic value of Nested polymerase chain reaction assay and antibody index for cerebrospinal fluid specimens. Case Rep Neurol. 2013;5 81-90. Mayo D and Boss J. Varicella zoster-associated neurologic disease without skin lesions. Arch Neurol. 1989;46:313-315. Muller NH, et al. Varicella zoster virus infection: Clinical features, molecular pathogenesis of disease and latency. Neurol Clin. 2008;26:675-697. Liana Falcone, et al. Cebrospinal fluid HIV-1 compartmentalization in a patient with AIDS and acute varicella-zoster vrius meningomyeloradiculitis. Clin Infect Dis. 2013;57:e135-142. Andrade P, et al. Transverse myelitis and acute HIV infection: A case report. BMC Infect Dis. 2014;19:149. Dworkin RH et al. Recommendations for the management of herpes zoster. Clin Infect Dis. 2007;44:S1. Kronenberg A, et al. Multifocal vasculopathy due to Varicella Zoster Virus (VZV): Serial analysis of VZV DNA and intrathecal synthesis of VZV antibody in cerebrospinal fluid. Clin Infect Dis. 2002;35:330-333. Outteryck O, et al. VVZ-related myelitis: A pathophysiological hypothesis. Rev Neurol. 2007;163:89-82.